Does Dish Network Really Work? You may have seen a Dish Network flyer showing all of the hundreds of channels they claim to deliver and wondered, does that really work? It’s hard to imagine a satelite being able to beam television and movies into your home, but many people seem to have their own little dish attached to their home. There’s currently a race to capture as much of the market as possible for television entertainment in the home. It’s basically the cable companies versus the satellite companies, and it’s fiercely contested. Each has their benefits and drawbacks, and mostly they are competing by offering better customer service, more channels, and a clearer picture. 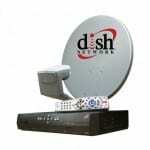 Dish Network claims to deliver hundreds of channels, over 260 if you go with their top plan, all in digital quality. It works by way of a satellite dish attached to your home and pointed skyward. As a consumer, you can’t really go wrong when it comes to choosing a television provider. Each company will no doubt hype up its service, whether they will overstate how good the picture will be, or how easy the installation is, or how many quality channels you’ll get. In the case of Dish Network, you will most likely get just as many channels, and just as clear of a picture as you would with their competitors like DirecTV or Comcast, so it’s a bit of a hype when they compare themselves to their competition and claim that they are much better. All of these companies have to compete on cost, because consumers will just change providers if they feel that they aren’t getting a good value. Dish Network charges $50 a month for their first year special, and this gives you access to all of their basic channels. You can add on movie channels for an additional charge, and they are also including a membership to Blockbuster at this time so you can stream movies directly to your TV. To get their best deals Dish Network wants you to sign up for a year of service. This is their way to entice you to stay with them for a longer term. This is one way that all of these providers use to build customer loyalty. The only problem with getting satellite TV over cable is that you’re still going to need phone service and Internet, and you’ll have to use different providers for each of those. If you get cable TV you can usually get a bundle package that includes both high speed Internet as well as a home phone line to boot. Another problem with satellite TV is that it relies on a good signal from the orbiting satellites and can go out in the case of bad weather or other factors. Also, if the dish breaks or gets stolen or vandalized you’ll have to wait for the service person to come by and help you out, or buy a new dish. With cable the instance of a bad signal, or no signal is very rare. Plus at time goes on these companies will be poised to offer fiber optics which will allow users access to super fast Internet and instant movie streaming. Satellite providers like Dish Network will never have this option. While Dish Network boasts hundreds of channels, many of them you won’t even watch, and others broadcast things that wouldn’t interest most people. It’s rather expensive since it’s just a single product, and you’ll still have to buy Internet and phone service to fully equip your home. It’s sort of a novelty having a satellite dish on your home, it has a sort of high-tech feel. But the real magic will come when cable provides update their infrastructure with fiber optics and start providing amazing picture quality, ultra-fast Internet, and lots more features for home users. Pass on Dish Network and go with your local cable provider. You’ll have an overall better experience, get the same channels, and be able to have the best possible Internet connection that’s always on and ready to go. If you just have to have it, give it a go and see for yourself. It could be a good fit for you, especially if you live in a remote area that doesn’t provide cable. What do you think? Does Dish Network work or not? Is Hulu Plus Really Worth It?